Anderson admitted to the offence and accepted the sanction, which also included an official reprimand proposed by match referee Andy Pycroft. There was no formal hearing. 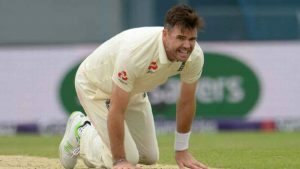 Anderson had also received a demerit point – and a fine of 15 percent of his match fee – during the second day of the Oval Test against India in September this year. On that occasion he was adjudged to have spoken to umpire Kumar Dharmasena in “an aggressive manner” and snatched his cap from the him following an unsuccessful appeal for lbw against Virat Kohli. Andy Pycroft was the match referee on that occasion as well. That was Anderson’s first offence since the introduction of the ICC’s revised Code of Conduct in September 2016. Demerit points stay on a player’s record for two years. The accumulation of four demerit points results in an automatic suspension. Srima Dissanayake, wife of late Gamini Dissanayae, bid adieu from the nation on Monday. She was aged 76 when passed away last Friday, 29 March.